Veterinarians routinely warn against feeding chocolate to dogs and cats, but what about mice? The charming little rodents are known chocoholics, breaking into bags of chocolate chips and gnawing at the corners of chocolate bars whenever they get the chance -- but that doesn't mean the dark confection is good for them. On the other hand, a food that's toxic to dogs and cats doesn't mean it's poisonous for mice. The unfortunate fact is, chocolate toxicity in mice has not been researched. In an article for the Rat and Mouse Gazette, Lori Chaddock, who works in the veterinary field, laments the lack of published information that could once and for all alleviate rodent owners' apprehension about feeding their mice or rats chocolate. In her article, Chaddock noted that veterinarians say that unsweetened bakers chocolate holds the highest levels of theobromine that is poisonous to animals and that, since it's unsweetened, mice aren't likely to want to eat it. 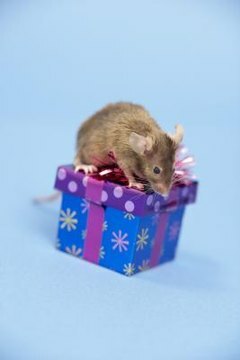 She also found that vets were hesitant to declare that chocolate as an occasional treat is OK for mice because they were concerned that overfeeding to a toxic level would occur. In modest amounts, chocolate must be OK to feed to mice, anecdotally at least, because scientists consistently feed chocolate to mice during research. In her book on preventing Alzheimer's, Jean Carper writes of a study in which mice were fed dark-chocolate flavanol to determine whether dark chocolate is beneficial for the brain. It is, by the way, but the point here is that researchers fed chocolate to the mice without concern that it would be toxic. The best approach when feeding your mouse chocolate or any treat is to use moderation. Half of a chocolate chip or a few shavings from a chocolate candy bar won't kill your mousy, although it won't do anything to contribute to his nutrition, either. Occasionally, such as two or three times a month or on his birthday, a bit of chocolate will be a sweet treat for your little friend. It won't affect his health, especially if you are feeding him a healthy diet otherwise, and he'll enjoy the tasty diversion from his typical fare. So chocolate is OK occasionally, but just what is a "good" diet for a mouse? Well, in the wild mice seek out grains and seeds, and those components are in most mouse mixtures you'll find in pet supply stores. Your mouse will eat fresh fruits and vegetables, too, and will even enjoy gnawing on an extra-crunchy dog biscuit to keep his teeth filed down. The truth is, mice will pretty much eat anything that smells appetizing, which is how they got the reputation for being connoisseurs of cheese. Dairy products are a bit rich for the little rodents, though, and not too healthy for them, so keep a lid on the cheese and opt for other, healthier foods as a basis for your mouse's nutrition.